View over Paris, at dusk, from the Maine-Montparnasse tower. Photo by Benh Lieu Song, licensed under CC BY-SA 2.0. 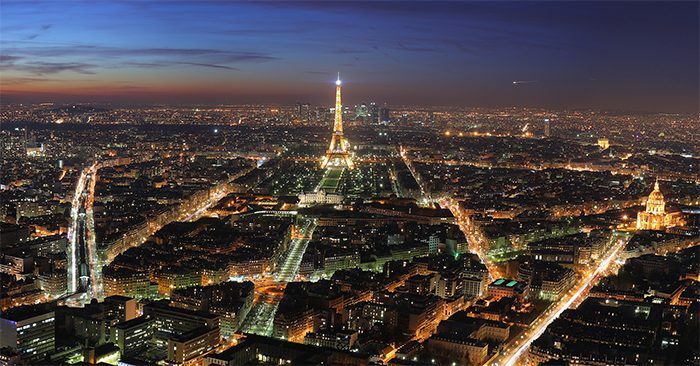 A new law came into effect in France on the first day of 2019 that sets an important standard in western Europe for the protection of nighttime darkness through controls on the emission of light in outdoor spaces. The “Decree of 27 December 2018 on the prevention, reduction and limitation of light pollution” is a significant step forward in establishing robust national-level policies that can help turn the tide away from growth rates in the past decade approaching ten percent per year in terms of both the lit area of European countries and the intensity of upward-directed light that can be detected from space. The Decree supersedes and repeals the existing national law in France, dating to 2013. It consists of two parts. The first establishes technical requirements for the design and operation of outdoor lighting installations and imposes these regulations on both public and private property owners. It contains a number of prescriptions that apply to various lighting situations, from parks and gardens to building exteriors and parking facilities. The second part specifies eleven sites of astronomical observatories throughout France that receive special consideration for the highest level of protection. The Decree is an expression intended to affect the implementation of the French Code of the Environment, Labor Code, and the Rules of the Road. Importantly, the Decree fully sets forth, for the first time, clear intent in establishing meaningful national regulations “designed to prevent, limit and reduce light pollution, including excessive disturbance to persons, fauna, flora or ecosystems, causing energy wastage or preventing observation of the night sky.” Its applicability extends to all lighting in France, taking aim at even cherished traditional applications such as the lighting of the exteriors of monuments and churches. However, it does so in a way that, in our opinion, is sensible and realistic, allowing for such applications while minimizing their impact through limits on the intensity and duration of use. This is result of extensive public consultations with stakeholders through the process of crafting the Decree, in order to craft a policy that respects the requirements of French law while remaining sensitive to the needs and desires of the French people. Outdoor lighting curfews. Curfews specify times of the night at which lighting must be dimmed or extinguished completely. These depend on the type of application and the setting in which lighting is employed, with a possibility that “more restrictive local adaptations” can be made at the direction of local officials. Limited exceptions are made for public displays of lighting during holiday periods, and the use of motion sensing switches is encouraged. Limits on the allowed emission of light directly into the night sky. The Upward Light Ratio (ULR) is limited in most cases to less than 1% of the total emission of a given fixture. Reduced influence of glare. Outdoor lighting must conform to a requirement that at least 95% of the light emission is confined to angles at or below approximately 14.5 degrees from the horizontal. This substantially cuts down on light in the so-called ‘glare zone’ of lighting and discourages lighting design that intends to direct light to areas especially far from the installation point of the fixture. Restrictions on the emission of blue light. The Decree requires that, in all instances, the correlated color temperature (CCT) of light not exceed 3000 Kelvins (K). CCT is the standard lighting industry way of quantifying the amount of harmful blue light that a fixture emits, where a larger number means fractionally more blue light; 3000K is identical to the current IDA guidance as part of our Fixture Seal of Approval Program. Additional requirements for protected areas such as nature reserves and parks sets the CCT threshold at 2700K for the “built environment” of towns and villages, and 2400K otherwise. Allowable illumination levels. In order to prevent use of excessive lighting that can compromise public safety, the Decree limits the amount of light used in any installation to no more than 35 lumens per square meter of illuminated target surface. For suburban and rural settings, the allowed limit scales downward proportionately to as low as 10 lumens per square meter. Light trespass into dwellings is prohibited, regardless of its source. The use of skybeams, lasers, and similar high-intensity light is generally prohibited. Nighttime lighting of waterways is generally prohibited, including light shining out to sea. There are concerns that the availability of highly energy-efficient light-emitting diode (LED) products is promoting the installation of new lighting where it is not needed, simply because the cost of providing it has fallen considerably in recent years. Given evidence that France, like most other developed economies, is experiencing an economic rebound effect from the rapid adoption of LED technology, public policies like the Decree are essential in order to slow the advance of artificial light at night into new spaces, both public and private. Article 3, Section II, Item 3. Article 3, Section II, Item 4. Lighting for roadway classes M1, M2, C0, C1 and C2 will adhere to the British Standards Institution standard BS EN 13201-2:2015 (“Road lighting. Performance requirements”), as specified elsewhere in the French code of laws. Article 3, Section II, Item 5. Article 4, Sections IV and VI.